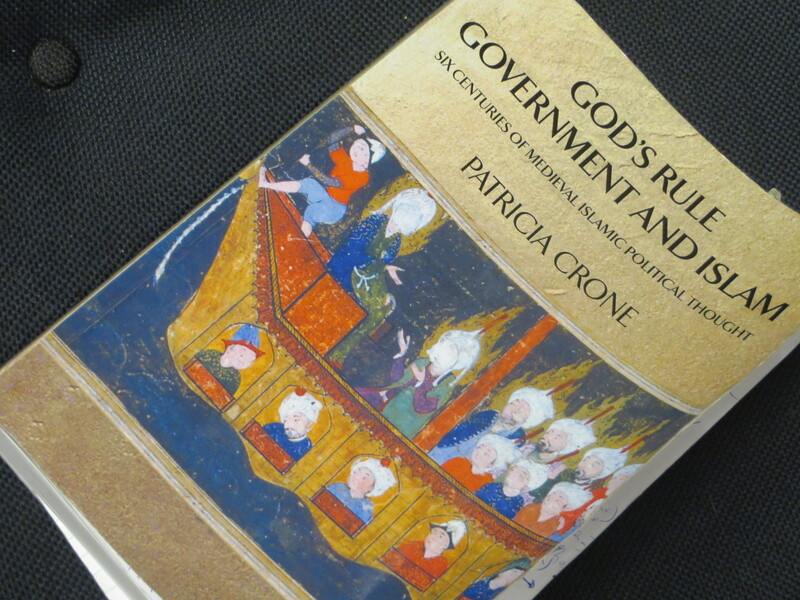 Definitely one of the most exciting and thought-changing books I’ve read in a long time, the late Patricia Crone’s God’s Rule — Government and Islam: Six Centuries of Medieval Islamic Political Thought can be looked at as a massive corrective to two types of claims widely circulated today in postsecular and postcolonial scholarly literatures and in conservative political philosophy (including conservative Jewish philosophy). The first claim concerns the putative non-separation of religion and politics in Islam. It is the view that religion and politics are inseparably fused, even identical, in pre-modern historical cultures. The second claim concerns the putative separation of religion and politics in the west. In this view, “secularism” is an arbitrary European or modern construct imposed upon other peoples and cultures in which that separation is unrecognized as such. Crone parses this out in relation to Islam and Islamic political thought, primarily by pointing out that the Prophet may have met that ideal standard fusing the religious and the political, but that after him political rulers are no longer prophets, and the scholars upholding the norms of Quran, Hadith, and Sharia law never really ruled. Deconstructionists used to call this the myth of origins. When then did the fusion of the religious and political fall apart? According to Crone, within one hundred years and after some three civil wars starting with the assassination of Uthman (the third caliph). But Crone suggests that already with Abu Bakr, the Prophet’s immediate successor, there was already a tension since he was not, after all, not a prophet (p.18). Against the notion that there is no difference or no separation between religion and politics in Islam, she shows how that relation fractures here, here, and here (in traditional Sunni theory, Twelver Shiism, Persian wisdom literature, Sufi piety). “Complexity” is the key term guiding Crone’s analysis, part of which seems to be that modern Islamic political theory fails to take into account the larger and more complex social forms that emerge after the time of the prophet (pp.15, 30-3, 59-61, 68-9, 85, 322). These complexities include the accumulation of wealth, class and social divisions, including the introduction of non-Arabic ethnic peoples into the Muslim umma, as well as non-Quranic, non-Sharia philosophical and spiritual traditions. The tensions here are basic. On the one hand, there is, in fact, the notion that the original Adamic condition was political, and that the Prophet created not a “religious community” but a people or umma. According to Crone, Islamic thinkers look at Islam as starting without the separation between religion and politics but soon find out that this non-separation was not tenable after the first conquests and the creation of imperial caliphates ruling over heterogenous populations (pp.14-16). Even still, it is important to note that the purpose and function of government do not assume the same separation of spheres as they do in either the United States or France. The function of government is to secure civil and moral order while also sponsoring essential religious duties (e.g. Friday services, pilgrimage, jihad) (chp.18). On the other hand, the actual institution of religious authority depends on God and the Prophet and then upon the jurist-scholar class (ulema), not upon the political ruler. In this, then, there is functional separation between religion and “the political.” Pointing to trends in both Sunni and Shia political doctrine, the caliph loses his status as the deputy of God. The scholars, whom Crone repeatedly describes as “apolitical” are left to control religion. She identifies al-Ghazali as the first to articulate this separation. Scholars should deal with prayer not politics, even if the distinction is not sharp since technically Sharia rule embraced both spheres (pp.243-55). At the same time, it is also true that Sharia law was commonly ignored by the political class (p.396). About customary law as competition to Sharia law, Crone mentions but says very little except to note its increasing prominence from the thirteenth century and on. (pp.396, 397-8). The idea that scholars should somehow control and limit government never made it to the table. The resulting modus vivendi established in medieval Islam is described by Crone as “tyranny of the caliph in government and tyranny of society in religion” (p.140). The question as to whether these two accommodations describe Islamic politics and political theories today in modern Muslim majority polities remains an open one. One would have to follow Crone and suss out historically and ideologically the variations to this basic tension. The more general upshot as I understand it from God’s Rule is that there is only one public domain in Islamic political theories, and that the religious functions sponsored by the state would belie any western model based on their absolute separation. But this does nothing to obviate the split between two types of governing authority and institution, one of which is recognizably “religious” and the other which is “secular” (pp.394-5). In its earliest decades, these three spheres (state, society, religion) formed a “perfect identity.” One circle inscribing all three spheres. After how many centuries, in practice and/or in theory, government is turns into its own separate and autonomous sphere. What we today call “the state” serves to upkeep religion but is not governed by it. For its part, society is overwhelmingly religious, protected by the state. Crone’s conclusion is that “At the end of our period we thus have a situation of minimal overlap with the Sharia in government and maximal overlap as far as society is concerned.” Over time, the spheres only continued to separate (p.397). That Muhammed was a political prophet in a stateless environment (p.12) cuts two ways. Yes, he needed to establish political authority as per Crone. But the position of being a political prophet in a stateless environment is so oxymoronic as to be fragile and tenuous. And there’s the critical rub today. What stands out as the weak link is not just the private status of the individual in many if not most majority Muslim countries but the relatively weak political status of society caught (and in some countries crushed) between the competing and dominating tyrannies of religion and state. Regarding how to assess the Crone’s picture of Islamic political thought, as a scholar of Judaism and Jewish philosophy I can only tread carefully. God’s Rule has two parts, one historical and one phenomenological. Both parts are excellent and helpful in terms of historical survey and conceptual mapping. What goes missing, is an historical-ethnographic or cultural-historical sense as to how these tensions might have been lived out, observed or not observed from the ground up by ordinary subjects, especially in relation to customary law. Otherwise, the history remains limited to a view from on high and the concepts might prove to be too static. Unable to assess the argument myself, I am left to rely on the authority of scholars in the fields of Islamic Studies. The question then is which scholars and scholarly or ideological approaches do you trust? Which makes more sense of a complex, human social datum? Proceeding on a parallel track, what I can say for now is that the basic parameters set out by Crone bear some resemblance to the medieval Jewish legal and philosophical traditions with which I am more familiar. Regarding what are effectively conservative manifestations of “post-secular” arguments made in Jewish philosophy about the non-separation of law and politics and religion in Judaism there is every reason to distrust as tendentious mis-readings. The same I assume would probably hold just as true in the academic study of Islam in academic and the politics of Islamophobia in the larger public sphere in Europe and in the United States. This entry was posted in uncategorized and tagged Islam, liberalism, politics, religion, what i'm reading. Bookmark the permalink.